Liebeck teaches aerodynamics, airplane performance and airplane design. As a child, Robert Liebeck loved tinkering with model airplanes. The UC Irvine adjunct professor of mechanical & aerospace engineering is still at it — but now he's working on a much different kind of model, one that could revolutionize air travel. Called the blended wing body, the concept results in aircraft that look more like sleek manta rays than today's tube-and-wing jets. 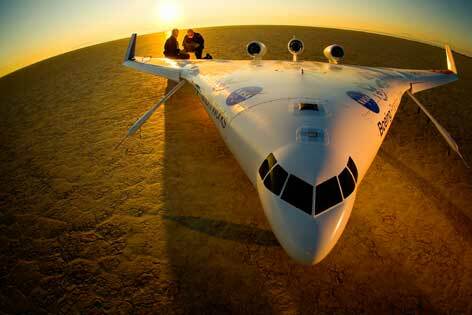 A BWB plane would burn about 20 percent less fuel than conventional planes, and because its engines mount high on the back of the aircraft, it would be an estimated 50 decibels quieter. "It could operate out of John Wayne Airport 24 hours a day," says Liebeck, who has been developing the BWB as a senior fellow at the Boeing Company for more than 20 years. While he admits it could be at least another decade before a BWB plane rolls off the runway, anyone who thinks it's a pie-in-the-sky project doesn't know Liebeck. In aeronautics circles, he's kind of a top gun. A member of the National Academy of Engineering, he's earned the most prestigious prizes in his field, including the American Society of Mechanical Engineers' 2005 Spirit of St. Louis Medal (past winners include astronaut Neil Armstrong); the 2010 Daniel Guggenheim Medal; and, most recently, the 2012 Brigadier General Charles E. "Chuck" Yeager International Aeronautical Achievements Award. "I think the reason I've won these awards is I happen to work on a couple of things that are tangible," says the self-effacing Liebeck. One of those tangible things is the high-lift airfoil that bears his name. "Airfoils are what you get when you look at the cross-sectional shape of a wing — if you cut through it to see the design," he explains.